Protection and dinner - what a deal! When Sir Paul McCartney plays his historic "Friendship First" concert in Tel Aviv tomorrow (Sept. 25th) to mark Israel's 60th anniversary, he'll have an unlikely ally, possibly literally at his side: Ted Nugent. Nugent is offering McCartney physical protection in light of death threats the ex-Beatle has received, namely from obscure Syrian-born extremist cleric Omar Bakri who posted a threatening message on his Internet broadcast: "Our enemy's friend is our enemy. Thus Paul McCartney is the enemy of every Muslim. If he values his life Mr. McCartney must not come to Israel. He will not be safe there. The sacrifice operatives will be waiting for him." "Regardless that Paul and I have our obvious social, cultural and culinary differences outside of music, I will not bend or waiver to voodoo religious whackjobs and neither should Paul. It would be my pleasure to keep this legendary musical hero safe from terrorists and madmen, and then buy him a nice dinner of tofu." Nugent, an NRA Board member who claims he's trained with law enforcement and unspecified military specialists for decades, boasted, "I'm Dirty Harry with a ponytail, and I'm at Paul's service." Strangely, we at MusicRadar feel a whole lot better about the situation. 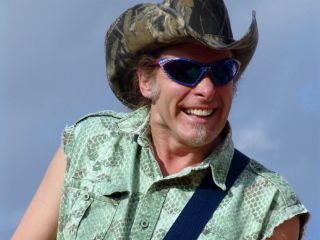 Be on the lookout soon for MusicRadar's riotous podcast interview with Ted Nugent.